In this blog, I will be discussing Trade Allowance Agreements and specifically the Lump Sum setup on the Trade Allowance Line. 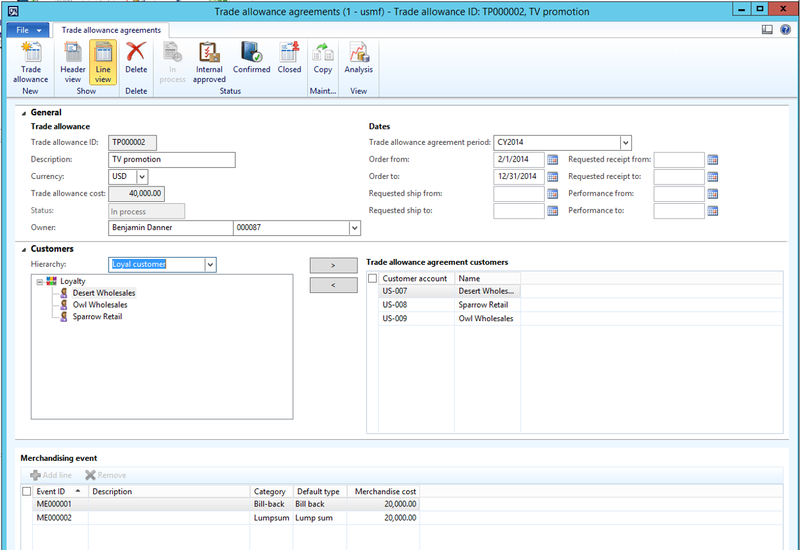 A trade allowance is similar to a monetary reward where the customer is paid based on their performance during the promotion and sales of an agreed upon item. 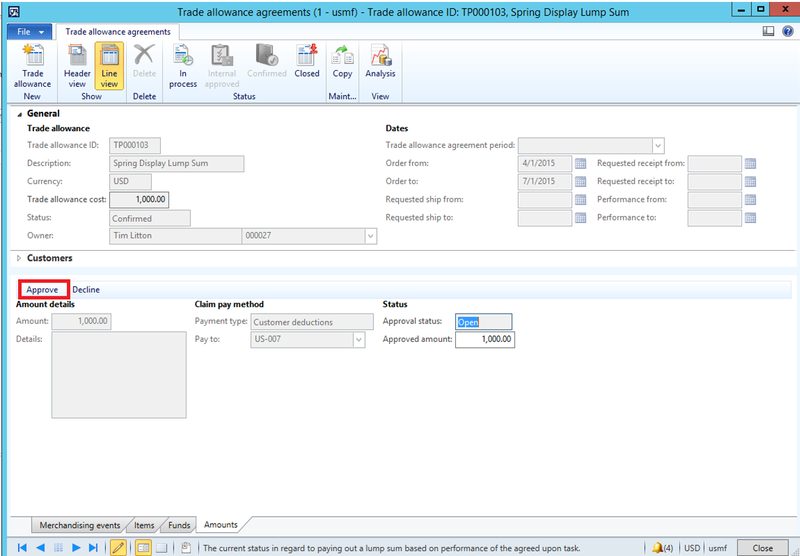 The trade allowance agreement form includes both a header and a line view. 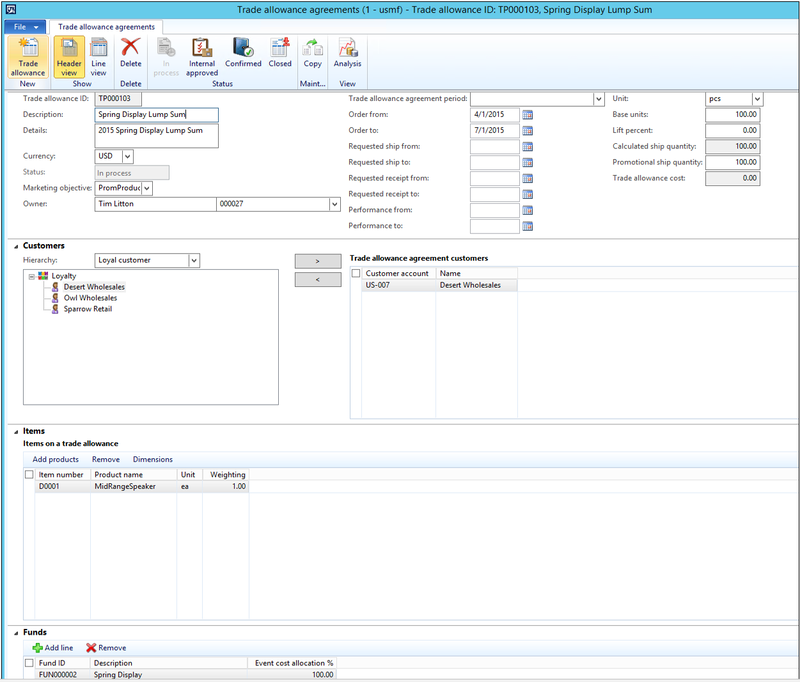 The header view contains fields which affect the entire agreement. Status: Display the status of the trade promotion as it passes through different stages of approval. Customer Approved: the customer has accepted the details of the trade promotion. This is the status that makes the trade promotion active. The only required Date fields are the Order from and Order to. 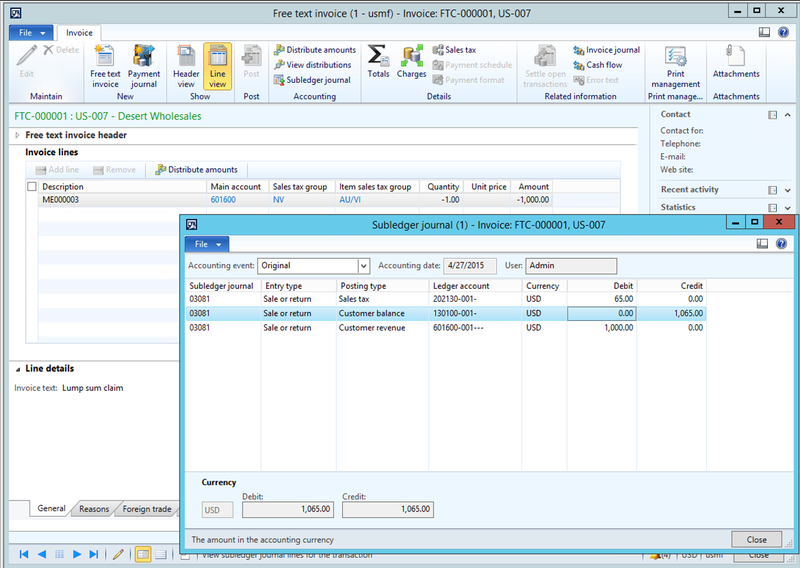 The analysis subsection on the general fast tab contains key fields that define quantities and costs used for the promotion evaluation, quantities of products sold to the selected customers before the promotion is specified in the base unit field. The only required Analysis field is Unit. 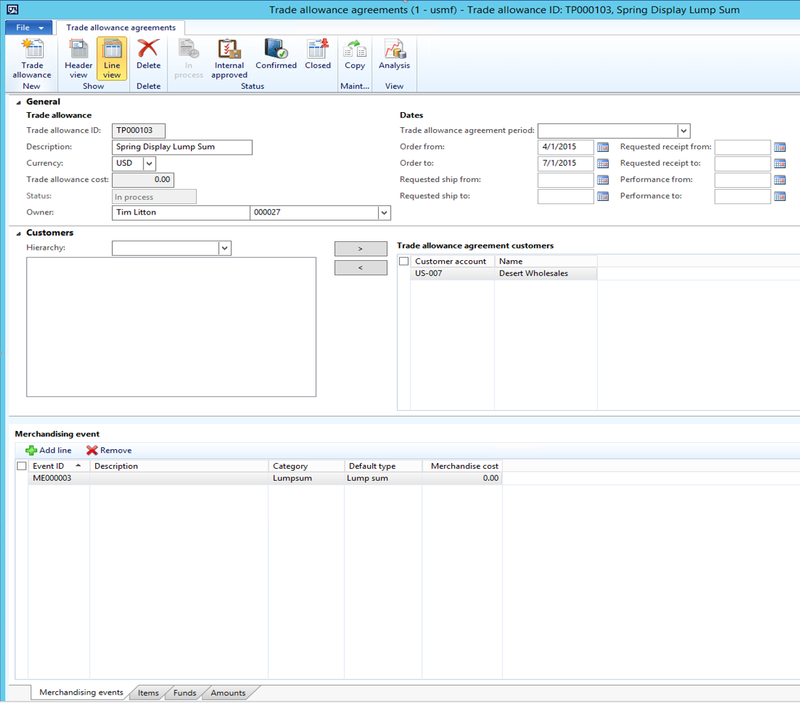 All items on the trade allowance must match or convert to the unit selected. Calculated ship quantity is calculated based on the lift percent, which is a planned target increase for the promotion in question. 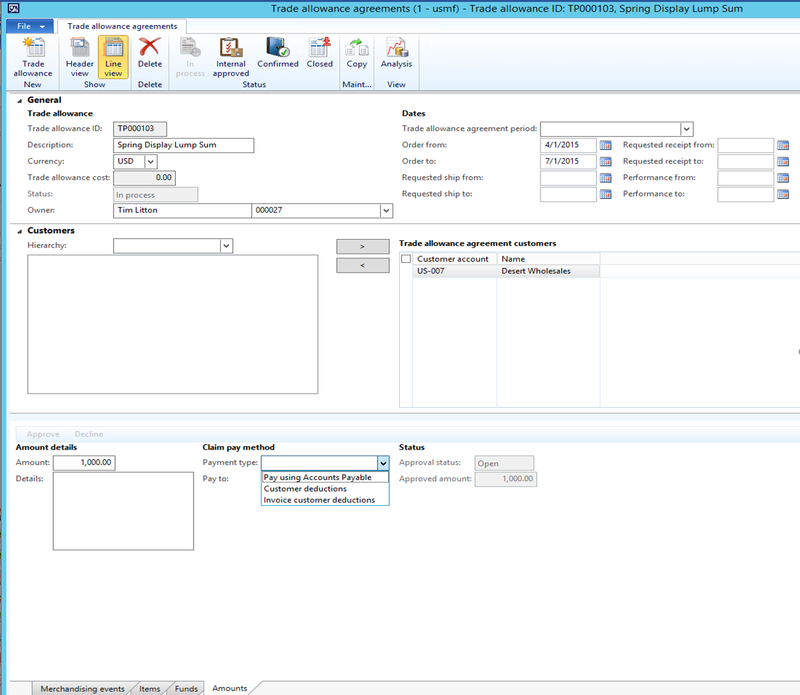 Hierarchy: Select and view customer group setup as pre-defined hierarchies, and then pick the entire hierarchy or selected accounts as targets for the allowance agreement in question. 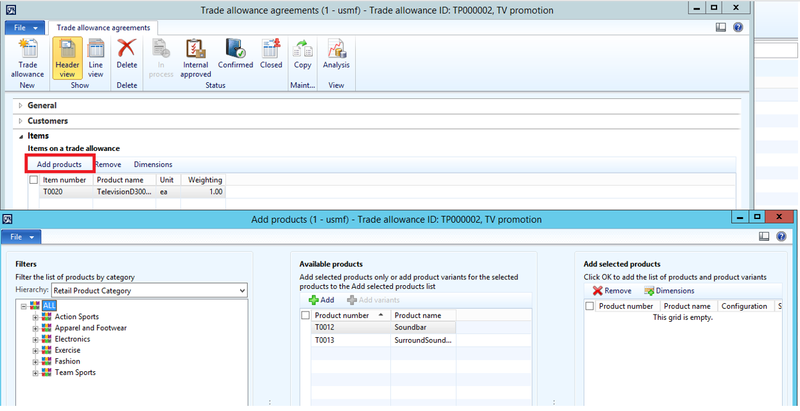 Add one or more items to the promotion based on the Hierarchy that is selected in the Add products form. Select the fund for the promotion. In the Event cost allocation % field, enter the percentage of event costs that will be taken from the fund. If multiple funds are specified, the total percent of all funds would add up to 100%. Trade allowance agreement lines are used to define the merchandising events. 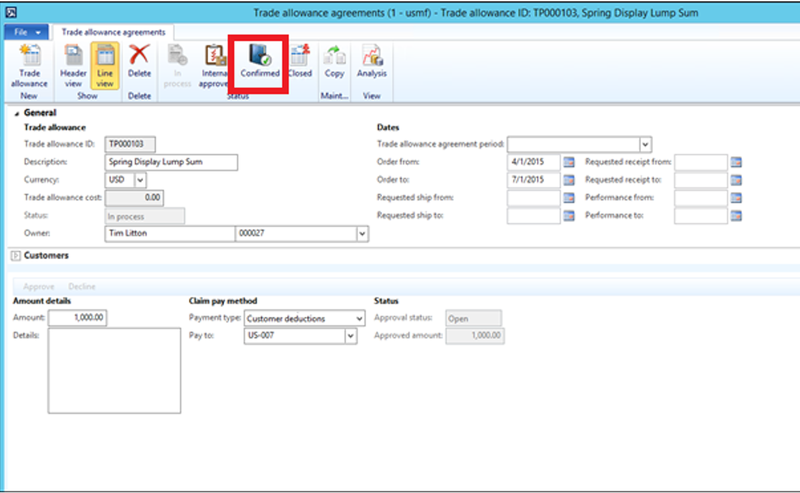 Once the trade allowance goal and funds are defined, merchandising events can be designed and applied to the agreement. This is the amount to be paid when the terms of the trade promotion are met. There are three different types of discounts that can be given on a trade promotion. The discount depends upon the category. Lump Sum: A promotion which requires the customer to perform a type of merchandising activity, such as a specific advertising campaign, putting up displays, etc. It is not based on incoming sales orders directly. When the requirements of the promotion have been met, a lump sum of money is given to the customer. Bill back: Throughout the life of this promotion, discounts will be calculated based on discount terms of incoming sales orders. At specific times, claims are generated to be approved for payment to the customer. Reimbursement is given after purchase. Off invoice: The discount is given during the pricing of an order that meets all of the promotion criteria. Taken at the time of order and automatically deducted before the customer makes a payment. No Reimbursement necessary. A vendor requests that one of its suppliers runs an ad for a specific product. The goal is to increase sales on the product. The customer approves the proposed lump sum reimbursement for providing advertising services. The ad runs and is provided to the vendor. The vendor authorizes for services rendered, and the agreed lump sum is reimbursed to the supplier. On the Trade Allowance there is a Fund setup to pay a lump sum of 2,000.00 to Desert Wholesales for promoting item D0001. The Item and Funds tab at the bottom will default information from the Header view. 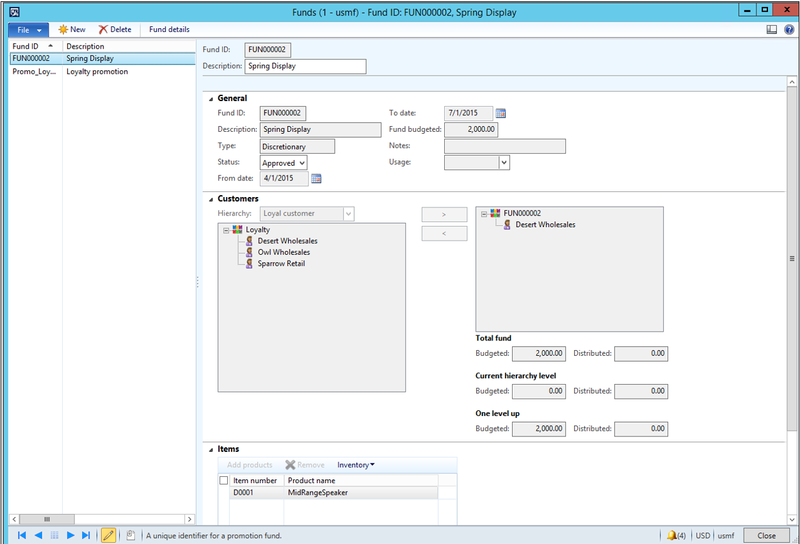 Pay Using Accounts payable will create vendor invoices. In this case, you have to enter a vendor account into the pay-to field. In this example, I will select Customer Deductions and select customer Desert Wholesale. Note, the Status field is greyed out. In order to change the Status, you must click Confirmed in the Header. Once the service is complete, click the Approve button and a message will ask about creating the Lump sum as an invoice for payment. During the deduct phase, a free text invoice is created with a negative amount. The invoice is registered as a deduction. 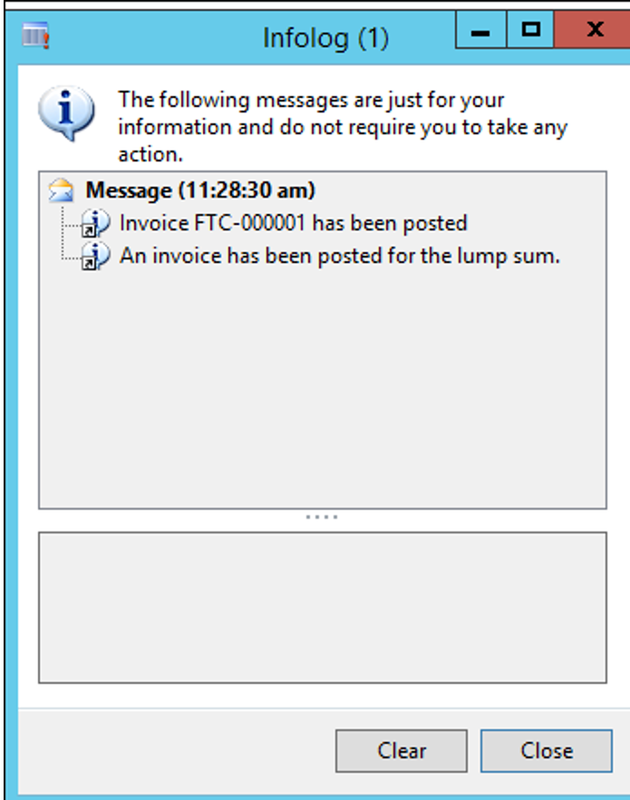 An Infolog will display stating that the invoice has been posted for the lump sum. 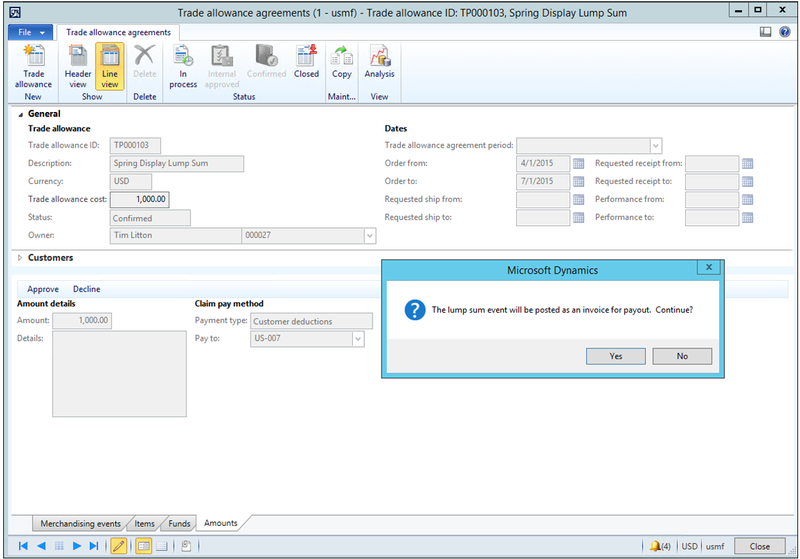 defaults from Trade Allowance parameters for the Lump Sum Expense Account. 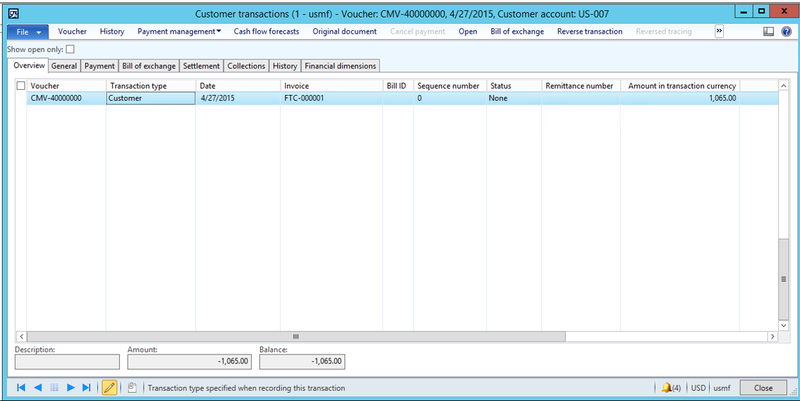 In Customer Transactions for Desert Wholesale, you can see that the Credit Memo Voucher (Deduction) was created. The Deduction can be used later for matching when the customer deducts amounts from their payments.